Ireland is famous for its many many ghost stories. We are pleased to add this new page to colours-of-the-rainbow.com in the hopes that it will both entertain and amuse you. Perhaps you know a famous ghost story that we don't! Please feel free to send it to us via our contact form and we will be happy to add it, giving you full credit of course. Cheers! The first of the ghost stories that we are happy to present is perhaps one of Ireland's most famous. Lord Tyrone was born John Le Poer and Lady Beresford Nichola Sophia Hamilton. The two were orphans reared by an unbelieving (atheist) guardian who constantly tried to convert them to his atheist views. Because of this the two made a vow to each other that whoever died first would reappear to the other in order to prove that there was life after death. In the course of time Nichola married Sir Tristam Bereford , the eldest son of Richard, Earl ofTyrone, and of Lady Dorothy Annesley, daughter of Arthur, Earl ofAnglesey. One night she awoke terrified to see her foster-brother standing next to her bed. He told her to be quiet, and said he had just died, consequently reminding her of the vow they had made years ago. He advised her of some future events, one which was the coming death of her husband and subsequent remarrying. he told her she would have four children and that following the birth of her last, she too would die on the day she turned forty seven. Lady Beresford sought confirmation that her brother's appearance was real and not a dream. At this Lord Tyrone grabbed her by the wrist, and it immediately shrank and withered. This deformity remained with her for the rest of her life, covered by a black silk ribbon she wore to conceal it. Lord Tyrone's predictions all came to pass with the exception of her death at forty seven. On her forty eigth birthday, Lady Beresford decided to celebrate with a few friends, including a clergyman who was an old family friend. "I am 48 today" she exclaimed. To her dismay the clergyman replied, "No my dear, you are only 47." Lady Beresford was shaken. "Are you sure?" she asked. The clergyman assured her he was as he had been looking at the register only days before. "Then you have signed my death warrant!" she cried. She retired to her room, made out her will and died later that night. In a place called Clongowes Wood, which is near Clane in County Kildare, there lived a family by the name of Eustace. The Eustace family forfeited Clongowes Wood because of their involvement in the insurrection of 1641, after which it passed into the hands of a Richard Reynel, who consequently sold it to the Browne family. One of the Browne men became a Marshal in the Austrian army, and during his time of service, the house was occupied by his two sisters. The sisters regularly engaged in needlework during the afternoons, and one day whilst working away in a room off the main hall, they were amazed to see their brother walk in in his full military uniform. He clasped his hands over his heart, and the sisters were shocked to see red stains on his tunic in that area. He led them upstairs, and uponfollowing him, they watched him disappear on reaching one of the bathrooms. The sisters, convinced that their beloved brother had been mortally wounded in battle, immediately went into mourning and had Masses offered for the salvation of his soul. A body-less wake was attended by local gentry who, as no suprise, thought it was a bit strange. However, the sister's worst thoughts were confirmed when an official letter arrived at the house informing the ladies of their brother's death in battle. Located in the River Awbeg Valley in County Cork, the ruins of Wallstown Castle give no indication to its bloody past. The castle was burned to the ground during the Irish Confederate Wars, and most of its occupants butchered. This is one of the most famous Irish Ghost Stories. One of the occupants that were spared was Colonel Wall, the family head, but he was imprisoned and eventually died in Cork Gaol. One who was not so lucky was Henry Bennet, a loyal soldier to Colonel Wall and a defender of the castle who was killed during the siege. It is said his ghost roams the ruins. A gentleman who lived in the vicinity of Wallstown Castle was said to have seen the ghost of Henry Bennet wearing his full Cavalier period dress, carrying a pole that he used in the past to stop travellers from entering the castle property. Whenever the traveller would ask him to withdraw the pole, Henry would laugh heartily and withdraw the pole. The same gentleman who saw him carrying the pole said that later Henry would come to his window and push the pole through. When the he screamed at him to remove the pole and go away, he would do so with the same hearty laugh! Lord Norbury, whose given name was John Toler was known as the Hanging Judge, and the subject of two famous Irish ghost stories. He was the official who presided over the trial of Robert Emmet, an Irish patriot who was hanged, drawn and quartered along with many others who lived in the big house in Cabra, Dublin. Before the house was pulled down just before the war, it was famous for many Irish ghost stories. One of those ghosts was that of Lord Norsbury, who upon his death was changed into a phantom black dog, cursed to spend eternity prowling the streets and dragging a huge chain around him. Norbury was also famous for convicting a young, recently married man from Blanchardstown, of stealing sheep, which was a crime worthy of the death sentence at that time. After he was hanged, the young man’s widow died shortly afterwards, but before passing away, cursed the judge on her deathbed. She vowed to return and haunt Norbury till the end of time, promising that she would never let him have a peaceful night’s sleep. Norsbury was said to have suffered from chronic insomnia after that, a deserving end to a brutal fiend. At Charles Fort near Kinsale in Ireland roams the mysterious White Lady! The fort was built in 1667, and shortly thereafter a strict disciplinarian by the name of Colonel Warrender was put in charge. His daughter, named “Wilful”, fell in love and married Sir Trevor Ashurst. On the evening of their wedding day, the happy couple to a stroll along the fort’s battlements. Wilful spotted some beautiful flowers, and expressed a desire to have them. They were halfway down the battlement wall, so a nearby sentry offered to climb down and get them for her, while her husband took over his guard duties. Sir Trevor agreed, and took the soldiers jacket and musket while the sentry went to search for a rope to use in his climb. After securing some rope, the sentry began his descent towards the flowers. Sir Trevor in the meantime had fallen asleep, when along came the governor making a spot check. He challenged who he thought was the sleeping sentry, and received no reply. Realising the soldier had fallen asleep on duty; Colonel Warrender drew his pistol and shot him dead – the penalty for dereliction of duty. Upon inspecting the body, Colonel Warrender stood aghast. He had shot his own son-in-law dead! His daughter came running upon hearing the shot, and when she realized what had happened, threw herself off the battlements to her death. Her father, overcome with remorse, shot himself later that night. The “White Lady” has been spotted ever since. She was spotted by a Major Black who saw her roaming about weeping in the early 19th Century. In 1880, she was seen by two officers; a captain by the name of Marvell Hull and a Lieutenant Hartland. They were making a room to room inspection of the premises when they were affronted by a woman in a White Dress. When she turned towards them, they were confronted with a lovely, yet colourless face, before disappearing through a locked door. Later, the same officers were flung down a flight of stairs by an unknown force. A certain Miss Hervey was visiting her friend, a distinguished Lady in Tasmania. One day, as she was coming down the stairs to have tea with her host, she saw the figure of a cousin of hers from Dublin who she was very close to, coming up the stairs. Without waiting to see it disappear, she ran to tell the Lady what she had seen. Her host laughed at her, but told her to write down the time and place of her experience, which she in turn did. This is the gist of her note: “On the 21 of April 1888, a Saturday, at ^ in the evening, I saw a vision of my cousin in a faded grey dress. In June of that same year, Miss Hervey was told of her cousin’s untimely death. She had died from typhus in a Dublin hospital at exactly the same time that Miss Hervey had seen her coming up the stairs. It’s interesting to note that her cousin was wearing the type of dress worn by nurses in the hospital in which she died, something that Miss Hervey had no prior knowledge of. Her description of the dress though, fitted perfectly that of those worn by the nurses. Near Monkstown, south of Dublin City, is a place called Widow Gammons Hill. 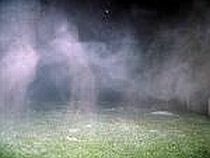 It is said that Widow Gammons Hill is haunted by the Widow’s ghost. It began many years ago in a monastery that stood on the spot. This was way back in Pre-Reformation Days (before the 16th century) and by the time of Cromwell (Oliver) and his cronies (1649-50) the monks were hiding themselves in local farmhouses to avoid persecution. Unfortunately for the monks, Widow Gammon was a Royalist, and she informed on them after which they ere captured and executed. After her death it is said that the Widow’s spirit was seen occasionally at the exact place where Cromwell’s troops has arrested the monks. One local gentleman insisted that when he had seen her, she grasped his neck, leaving a burnt scar on the spot which stayed until his death. “Three years later” she continued, “the same two men saw her emerging from the ruins of an old castle in the area. She held a glimmering object which looked like a sharpened axe in one hand, and the key to the graveyard in the other. She crossed swiftly from the old castle, opened the graveyard, entered and vanished once more.” She has been seen since by others, still roaming around with the axe in one hand and the key to the graveyard in the other. Had Enough of Irish Ghost Stories? Check out some Legends from around the World.